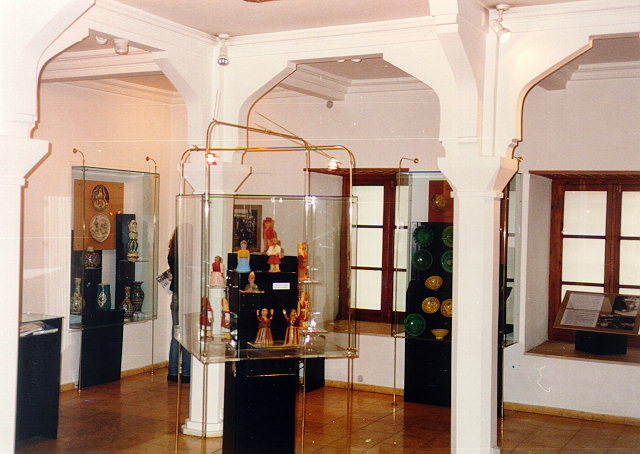 Since 1975 The Tzami in Plateia Monastiraki has housed the rich Pottery Collection donated by Professor V.Kyriazopoulos, with a renewed exhibition display from 1991 on, when the building had been restored after the 1981 earthquake. The Collection contains two basic categories of pottery, which dictated their grouping in the museum. The one on the ground floor consists of works by known ceramicists: Minas Avramidis, Nikolaos Theodorou, Nikolaos Giasiranis, Makarios Vardaxis and Dimitris Migdalinos, and is chiefly ornamental in character. The second, on the upper floor, includes utility objects, with a few examples of touristic reproductions, and is arranged as far as possible according to geographical provenance. For the display of the collection neutral materials like metal, glass and plexiglass were preferred, so as to differentiate the mdern musum elements from the traditional morphological features of the building.